Gladinet Cloud and Gladinet Cloud Enterprise make it simple to share files and folders internally with team members, as well as with external partners, clients and vendors, or mobile workers outside of company premise. Not only can you share files by uploading to online cloud storage first and then share it out, also you can share the files directly from your file server over the Internet, without waiting for the upload process to finish. You may have mobile work force such as employees in sales that need to go out to visit customers. The marketing department is creating sales collaterals and marketing materials back in the office and save them to an on-premise file server. The sales team is out there in the field showing the white paper, solution brief and data sheets to customers, and also collecting customer requirements that need to save back to the central file server. Your sales team and your marketing team need a file sharing solution centered on your on-premise file server. In general, you have built your company infrastructure around Microsoft File Server and Windows network share. You would like to extend the ability to share files from file server to sharing over the Internet to laptops and mobile devices. Mobile workers usually take documents with them on laptop, collecting requirements on-site with the customer and save to laptop. When they come back to the office, they will sync up with the file server, either download new materials or save requirements back to the file server. It is a manual process and could be skipped. team members may also use email to pass documents around. Over time, these documents scatter around in email system but not coming back to the file server, the central repository. Some online storage solution also allow you to upload files to the online storage for sharing purpose. However, office worker may already trained to save documents to a file server. Employees need to be re-trained to use a different solution. You prefer the sharing solution is centered around your file server, not a new online storage repository. Gladinet allows you to share directly from file server. It is a unique patent pending technology that attaches your local folder to online cloud storage. Once it is attached, it can be immediately shared over the Internet, not waiting for the full upload to complete. Employees back in the office can continue to save files to a file server as they were trained in the past. The files and folders will show up immediately in the Gladinet Cloud account for sharing purpose. Employees out there with the customer now have an array of new access methods, such as browser based file manager, desktop client or even mobile app, allowing them to access the files anywhere, with any device and do it securely with their credentials. They can also upload files directly in web browser, or save to a local folder that is attached to their Gladinet Cloud account. The company IT staff will install Gladinet Cloud Server on the file server that needs to share files and folders. After that, folders locally on the file server can be attached to Gladinet Cloud, within the company account. 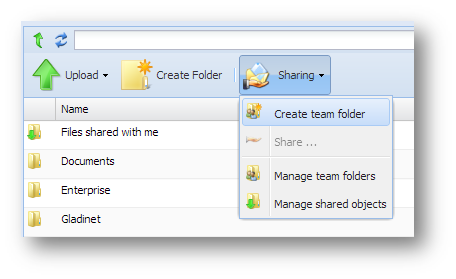 The administrator of the Gladinet Cloud account can then share the folder as team folder to everyone need access. Gladinet Cloud Server and Gladinet Cloud Team Edition allow an organization to provide simple, secure files and folder sharing solution over the Internet, directly from the file servers.